My son Joel and I are on a heron search. Ever since that day, driving our usual route through Winton Woods, when a great blue heron rose through the mist on the roadside pond, immense wings beating with a slow, steady rhythm. He flew parallel to the car window for several beats, then ascended with a powerful surge over the car, out of our line of vision. Those few strong wing strokes fanned a spark—kindled a flame of desire in my heart to rise above the mundane details of daily life, to catch the glowing beauty all around me and store it in my jar of memory. And so we’re on a heron search. He surprises us here and there, our heron friend; fishing, lake-side, as we walk the trail around Winton Woods; hiding in the reeds on the edge of the pond at Parky’s Farm; flying gracefully overhead in a cloud-swept sky. We’re getting well acquainted. Each time we meet we uncover a new lesson he’s come to teach us. A study in meditation, he reminds us to slow down, to pay attention, to savor the moment, to live in the present. He tells us to practice patience, to study our surroundings, to walk softly ’round the pond, lest our footsteps disturb new life. Rise above, heron tells us. Rise above petty details. Rise above binding worry. Rise above self. And when you come back to earth, walk in beauty, walk in grace, walk in watchful wonder. 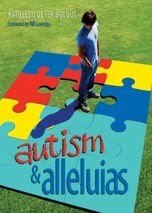 You can read another post by Kathleen Deyer Bolduc, author of Autism & Alleluias on my book blog HERE.